Wow! What a Saturday! We had another great turnout today here at the Parsons House. Jill continued digging inside the house in a small room dubbed, “the buttery”. Unfortunately, there is no documented evidence of butter actually being produced there. Elana and Linda continued digging in the yard with our many volunteers and Mary continued cleaning and cataloging artifacts with her wonderful volunteers. We would especially like to thank the professional archaeologists that so generously volunteered their time today. Without their help, we certainly would not have this much great work done! In addition to excavations, a whole host of games and toys were available for our younger visitors. We wanted them to understand how children’s lives in the 18th and 19th centuries were very different from their lives now. Children back then did not have toys at their disposal or even that much time to play. Many children were hard at work in and around the house. When they did have some down time, they often made their own toys. So today, our small visitors learned about some of these toys. We provided hoops and sticks, which were a huge hit, bubbles to blow only using a straw, clay to make marbles, tops, jacob’s ladders, jump ropes, and broken plates to be reassembled. All the kids had a blast! We have one more week here in the field and so much more work to do. 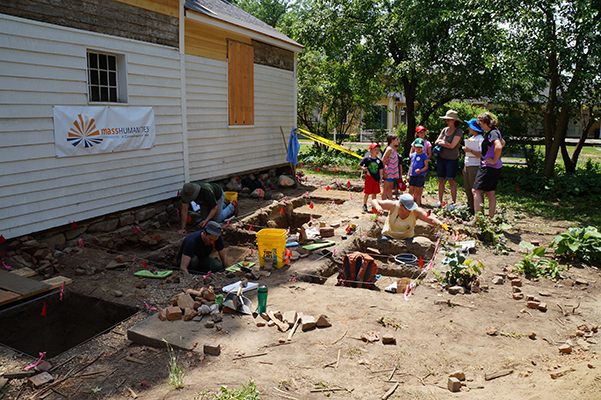 We can’t wait to see everyone next Saturday, June 6, for our last public day at the Parsons House Archaeology Project!! 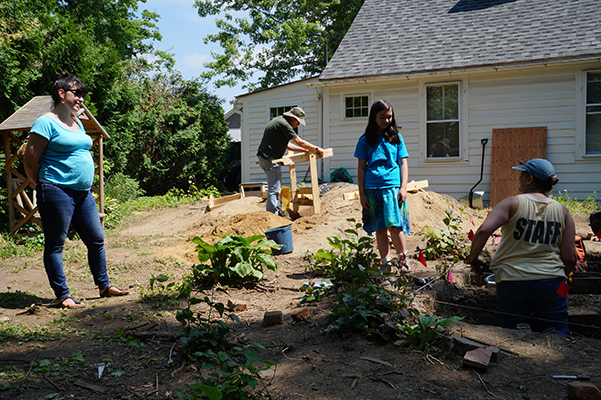 UMass archaeologist Kerry Lynch talks with a budding archaeologist. Some of the great visitors at the site today.